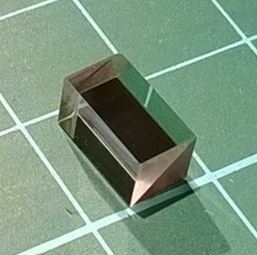 Introduction: Polarizing beam splitter cubes are used to split a laser beam into two orthogonally polarized components; p-polarization is transmitted straight through while s-polarization is reflected at 90-deg. PBS Cube is commonly made by precisely cementing two triangular optical prisms together at their hyoptenuse using polyester, epoxy, or urethane-based adhesives. PHOTONIK polarizing beam splitter cubes utilize a durable all-dielectric optical coating at the internal cemented interface, (Dichroic mirrored prism assembly); and all external surfaces are antireflection coated for the wavelength specified. For best spectral performance and transmitted wavefront, cube beamsplitters should be used with collimated or near-collimated input light. The PBS and other cemented beamsplitter cubes are easy to mount, mechanically durable and ideal for use up to 1 J/cm2 at 1064 nm. Introduction: These polarizing beamsplitter cubes use a coating rather than birefringent materials to split S & P polarization with a 90-deg deviation over 400-700nm. Introduction: These polarizing beamsplitter cubes use a coating rather than birefringent materials to split S & P polarization with a 90-deg deviation over 600-900nm. Introduction: These polarizing beamsplitter cubes use a coating rather than birefringent materials to split S & P polarization with a 90-Deg deviation over 700-900nm. Introduction: These polarizing beamsplitter cubes use a coating rather than birefringent materials to split S & P polarization with a 90-Deg deviation over 700-1100nm. Introduction: These polarizing beamsplitter cubes use a coating rather than birefringent materials to split S & P polarization with a 90-Deg deviation over 830-890nm. Introduction: These polarizing beamsplitter cubes use a coating rather than birefringent materials to split S & P polarization with a 90-Deg deviation over 1150-1700nm.